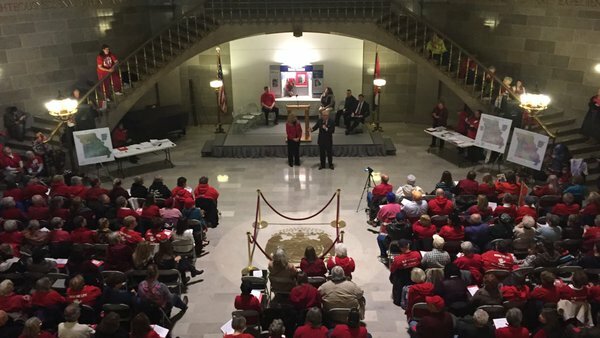 Thanks to the hundreds of Missouri Right to Life supporters who attended Tuesday's "Show Me Life" Pro-Life Action Day. It was a beautiful day in every way! Lt. Governor Peter Kinder speaks to pro-lifers at the noon rally. Click here for more pictures of our wonderful speakers on our Facebook page. And, mark your calendars: there will be another pro-life action day this coming April 5! "We've had a team of lawyers looking at every detail of the language," said Susan Klein, legislative liaison for Missouri Right to Life. "Our lawyers have come to the conclusion that we have pro-life protections that we need in this initiative, and the funds collected through this tax will not go to abortions, human cloning or embryonic stem cell research. "...read more. Click here for MRL's official statement on the proposed "Raise Your Hands for Kids" tobacco tax initiative. Abortion Clinic Inspection bill (SB 644) to be heard in senate next week! Call your Senators and ask them to pass SB 644 to protect women and save babies! The smallest surviving baby born at Carolinas HealthCare System is finally headed home more than four months after she was born...read more . H.R. 3515, introduced by Reps. Chris Smith, Vicki Hartzler, Virginia Foxx, and Trent Franks, would prohibit the performance of dismemberment abortion...read more. A Cole County Circuit judge has dismissed a lawsuit filed by a New York-based group called the Satanic Temple that challenged Missouri's 72-hour waiting period/informed consent laws on abortion...read more. When Adam was born just over four years ago in India, he was immediately abandoned by his birth parents. Born with severe physical deformities, including a cleft lip and palate, no eyelids, no nose, fused legs, and hand abnormalities, he was considered a curse, and his parents threatened to kill him if they were forced to bring him back to their village...read more. Advocates of physician assisted suicide will tell you that their motivation is simply to help end pain. But as this woman's case evidences, "pain" takes on varied forms for different people...read more. What could a petri dish have to do with national security? A whole lot, according to U.S. intelligence officials. As far as our top spy, James Clapper, is concerned, that's where the world may be building the latest weapon of mass destruction...read more.